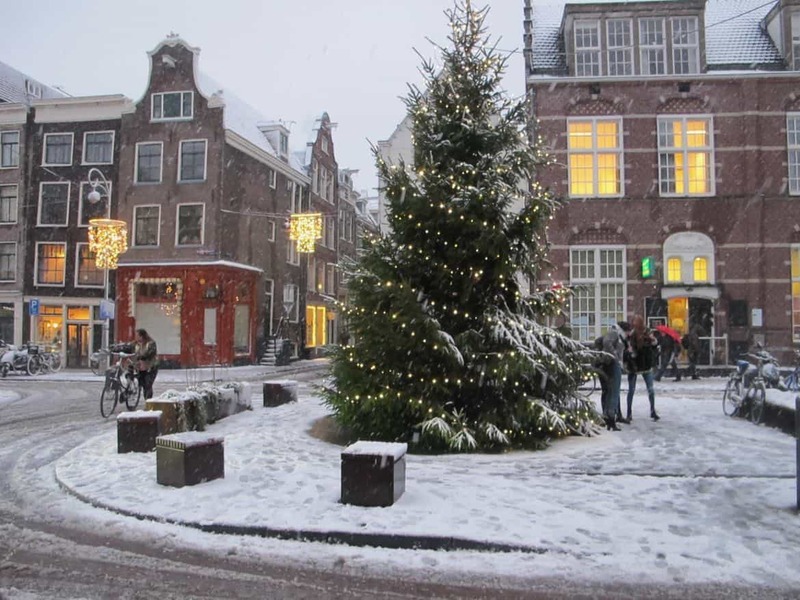 In Amsterdam, there are many special Christmas events in november and december. Museum Square turns into a wonderful Christmas Village, where you can enjoy Dutch treats, visit the Amsterdam Christmas market and go ice skating. All December long there are Christmas markets in Amsterdam. The Amsterdam Light Festival lights up Amsterdam in a feast of colours, best seen from the water on a special Canal Cruise on the Amsterdam canals. The spacious conference center RAI converts in a Winter Paradise with a giant ferris wheel, christmas market, snow, food, drinks, cinema and ice rink! Christmas is considered a family occasion in The Netherlands. The spirit of Christmas enters The Netherlands after the traditional Dutch feast of Saint Nicolas (Sinterklaas) on December 5, 2018. Christmas Eve, (December 24) is ‘Kerstavond’, but there is no special celebration. Catholic or protestant people might attend the traditional Christmas mass followed by hot drinks with family or neighbours. December 25 is ‘(First) Christmas Day, an official holiday in The Netherlands. Most shops and restaurants in Amsterdam are closed on Christmas Day. In the afternoon, Dutch people visit their family to enjoy the christmas dinner. Giving presents for Christmas is not a Dutch tradition. Usually children have already been spoiled during the feast of Saint Nicolas. The Second Christmas Day (Tweede Kerstdag) or ‘Boxing Day’ is another official holiday in The Netherlands. Most people spend this day also with their family. In Amsterdam, many shops and restaurants are open as usual. The Christmas spirit enters Amsterdam when the lights on the gable of luxury department store Bijenkorf are lit. Every year, a crowd gathers on Dam Square to witness the event. In 2018, Turn on the Lights, is on November 17. On Friday 8 December, the massive Christmas tree on Dam Square is put in its place. When the light in the Christmas tree are turned on, it’s a festive celebration with carol singers and festive food. From the end of November till the end of January, the city of Amsterdam lights up with light sculptures, projections and art installations along the roads, squares and even on the water of the canals. A special walking route guides the visitor along the artworks. The Amsterdam Light Festival 2018 can be seen by everyone for free. Great to take photos! The Amsterdam Light Festivals is best seen from the water, because many of the light art work is place above the canal and the river Amstel. Canal cruises offer special guided routes along the artwork. The Amsterdam Light Festival Cruise takes 75 minutes. Let yourself be enchanted by the illuminated canal houses, bridges and light works of art and experience the unique atmosphere from the water with this Water Colours Cruise. With audioguide. Prior to the cruise, you can enjoy a winter apple punch, mulled wine (glühwein) or hot chocolate. In December 2018, the Museum Square (Museumplein) is the heart of all Christmas events in Amsterdam. The large square is transformed into an Amsterdam Christmas Village. The pond becomes a popular ice rink. You can rent ice skates here and try the most popular Dutch winter sports for yourself. There is even a miniature version of the Skinny Bridge. Around the pond, stalls are set up for an Amsterdam Christmas market. You can buy Christmas presents and original souvenirs. The markets stall offer the best of seasonal treats from Holland, Germany and Belgium, like mulled wine, pancakes and warm sausages. A special Christmas edition of this art & designers market at Amsterdam’s Museum Square. This is also the first day of the Amsterdam ice rink so you can skate and shop! Combine a visit to Haarlem, Amsterdam’s charming little sister with a visit to their famous christmas market on the main square. Three hundred festive Christmas stalls can be found in and around Grote Markt square and various shopping streets. With music everywhere! Another great attraction is Kerstkorenlint, several choir performances at various locations, including Gravenzaal (Counts’ Hall) at the town hall in Grote Markt. Also not in Amsterdam, but Leiden is easily reachable in a 40 minute train ride. And it’s worth it. The historic town of Leiden dresses up for Christmas with a huge floating christmas market. Christmas decoration, outfits, live music and hot chocolate milk, this event offers a christmas market in Amsterdam with lots of style. At the Dutch Sissy-Boy office in Amsterdam Noord. Get some original christmas presents at this Japan Fair while you enjoy the Asian bites and drinks. Held at the NDSM in Amsterdam Noord. Special christmas edition with design, fashion and art, sold by their own makers at Westergasfabriek. The market is indoor and outdoor. The traditional Christmas market at Amstel Kwartier is located next door to café tHUIS aan de AMSTEL. You will be warmed with glühwein, open fire, a choir and lots of niceties to eat, drink and buy, like herbal tea from Amsterdam, fresh smoked salmon, home made present and many cakes and pies. Special edition of the Sunday Market in the heart of the city, near Dam Square. Special edition of the Sunday Market at the historic center of Amsterdam: Nieuwmarkt. Guilt-free shopping with eco-friendly and exclusive deals: From home made candles, to exclusive jewelry, there is something for everyone. Amsterdam Winter Paradise at RAI. The ‘Winter Paradise’ is set up at convention center RAI, a convention centre. Outside, on the Winter Square you can roast marshmallows by the fire and stroll around on the Christmas Market. Expect a Christmas Choir and a food market where you can try typical Dutch winter food like pea soup and ‘oliebollen’ Several well known restaurant ‘pop-up’ at the Amsterdam Christmas Parade. A 50 meter high giant ferris wheel takes you up above to give you a grand view of the city. In the evening it’s time for music, drinks and karaoke, German style. A Christmas market in Amsterdam wouldn’t be a Christmas market without a ice rink. Expect 700m2 covered with ice, even curling, slides, fun games for kids and a silent disco on the ice. Entrance is 17,50, free for children under 3 years. You can get to RAI using public transport in Amsterdam. RAI has its own metro station (Metro 51 from city centre/Central Station and Metro 50 from Amsterdam West)) and train station. Tram 4 runs between the RAI (Europaplein stop), Amsterdam’s city centre and Amsterdam Central Station. Some museums (Anne Frank House, Biblical Museum, Rijksmuseum, Foam) in Amsterdam are opened on Christmas Day, though they tend to close earlier than usual. If you want to go to a Kerst Mis (Christmas Mass) in Amsterdam, prepare, because it has become more and more popular. Go early and don’t be discouraged by the line of people waiting outside. And dress warm. Noorderkerk (Jordaan) – Singing Christmas songs and listening to Bach, Mendelssohn, 20.00. Hot chocolate afterwards. Oude Kerk (old centre/red light district) – Singing international songs, 21.15. Money collected goes to prostitutes from the area, gluwein afterwards. Mozes & Aaronkerk (Waterlooplein)– Celebration with representatives from different religions (priest, Buddhist monk, Islamic imam, Jewish chazzan, 19.00. Christmas bread and gluwein afterwards. Are shops in Amsterdam open on Christmas Day? During the holidays, shops open longer than usual in Amsterdam (till 21.00), especially departments stores such as Bijenkorf, Kalvertoren and shops like H&M, Zara, Mango and Primark. But on Christmas Day most shops in Amsterdam are closed. On Boxing Day, 26 of December, most shops and restaurants are open as usual. Celebrate New Years Eve in the streets in Amsterdam. The biggest get together traditionally takes place at Museum Square. Party starts at 18.00. There are live performances from mostly Dutch bands. At 00.00 there is grand fireworks. The event is broadcast live on television. Entrance is free, but controlled. You cannot bring any glass, nor fireworks. Other options are Leidseplein and Rembrandplein and Waterlooplein. At Nieuwmarkt, traditionally the Chinese take over, which means lots of (dangerous!) fireworks around everywhere. So go there at your own risk. Warning: In The Netherlands New Year is celebrated with the use of lots and lots of fireworks. Apart from the large scale firework show in Amsterdam by the Amsterdam council, there’s many people who buy it themselves and set it off in the streets. So Amsterdam will transform into a war-like zone. If you don’t like explosives going off around you, stay at home. Almost all Amsterdam clubs are open for Amsterdam New years Eve parties. Generally, the best ones sell out early, so buy your tickets in advance. Tip: If you want to enter a party or club very late (like after 4.30), try to bargain off the price at the door. Enough to see and do for a great Christmas Market in Amsterdam. Hello. does any one know the dates for 2016 Rembrandtplein Christmas market? thank you. Obviously, but I want to know the from and to dates as I want to visit…. I’m going to Amsterdam on the 28th-31st December. are there any Christmas markets at this time? It’s really too soon to say anything about Christmas in Amsterdam. Hi, we are planning to visit Amsterdam from 23rd to 25th December 2017. How about the city on Christmas day? Is everything closed on 25th? How about the public transport? On Christmas day, most of the shops in Amsterdam will be closed. Some tourist/souvenir shops might still be open. The bigger museums like Rijksmuseum are open. Public transport is functioning as normal. Enjoy your holidays! How about on Boxing Day? Will shops and restaurants be closed? On Boxing Day, shops and restaurants in the centre of Amsterdam will be open as normal. Christmas Lights at Bijenkorf, Amsterdam Dam Square. The Christmas spirit enters Amsterdam when the lights on the gable of luxury department store Bijenkorf are lit. Every year, a crowd gathers on Dam Square to witness the event. In 2017, the event, Turn on the Lights, is on November 18.It is a great event to see. In 2017, the Spanish theatre company Grupo Puja entertains the crowd with a show of acrobatics, music and light. Fireworks accompany the turning on the lights. Hi! I made a mistake! It’s Thursday 16 November 2017. Sorry! Thanks for your comment.